Ken Schweitz, President, Dan Henning, VP of Engineering and Lucas Boettcher , Regional Manager will be at this MedTech Event in New York. We’ll be there to discuss the RIM molding process and the geometry of your life science project. It is helpful if you can bring along your CAD file to take a look see at your geometry. We’ll be able to advise if the RIM molding process is well-suited based on your geometry, the application and or environment the parts will be used in along with your estimated annual usage. Since Premold Corp is a vertically integrated company, we do our own in-house tool building, painting, graphics and even assembly. We can provide as little or as much work as your project and project team requires. With our recent expansion we are prepared to take on a more aggressive work load. Ask us about our expansion project. 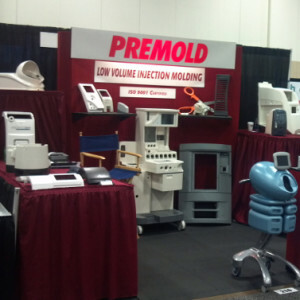 We’ll have examples of tabletop instrument enclosures as well as fullyl assembled medical carts. You will be able to evaluate the parts the robust parts molded from the resins, that provide for varied wall thicknesses. We look forward to seeing you there at booth 957.